These are State Parks, (not to be confused with National Parks), in the confines of the beautiful rural wilderness of the southwestern area of the great state of Pennsylvania and a summary of their regional history. If you haven't noticed, I am ever so partial to the land I come from! Nah, no apologies now, it would hardly conform to a side of my paternal Scotch-Irish ancestral heritage! I'm not so sure about the German ancestry, either. I love other states and even some other countries, so I'm not that prejudiced, really. Whether we're discussing Yellowstone or the Grand Canyon, there are great state and national parks all through this marvelous country and we surely share this between us, but these are very special too, part and parcel of our local area. "Conservationists like Dr. Joseph Rothrock became concerned that the forests would not regrow if they were not managed properly. Lumber and iron companies had harvested the old-growth forests for various reasons. They clear cut the forests and left behind nothing but dried tree tops and rotting stumps. The sparks of passing steam locomotives of the Pittsburgh, Westmoreland and Somerset Railroad ignited wildfires that prevented the formation of second growth forests. 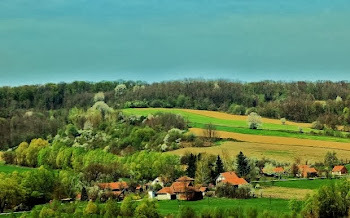 The conservationists feared that the forest would never regrow if there was not a change in the philosophy of forest management. They called for the state to purchase land from the lumber and iron companies and the lumber and iron companies were more than willing to sell their land since that had depleted the natural resources of the forests. The changes began to take place in 1895 when Dr. Rothrock was appointed the first commissioner of the Pennsylvania Department of Forests and Waters, the forerunner of today's Pennsylvania Department of Conservation and Natural Resources. The Pennsylvania General Assembly passed a piece of legislation in 1897 that authorized the purchase of "unseated lands for forest reservations." This was the beginning of the State Forest system. There are two million acres of state park land in Pennsylvania. Do keep in mind the rules and regulations concerning the individual parks. They are usually posted near the entrances. Also, the size of the descriptions here given do not relate to the importance of the parks in question. That is merely the result of the amount of data collected. Finally, much more material could be included regarding various other subject matter that come within the confines of these large forest areas. This is, unfortunately, beyond the scope of our post and other historical info is available in my other posts on the site. 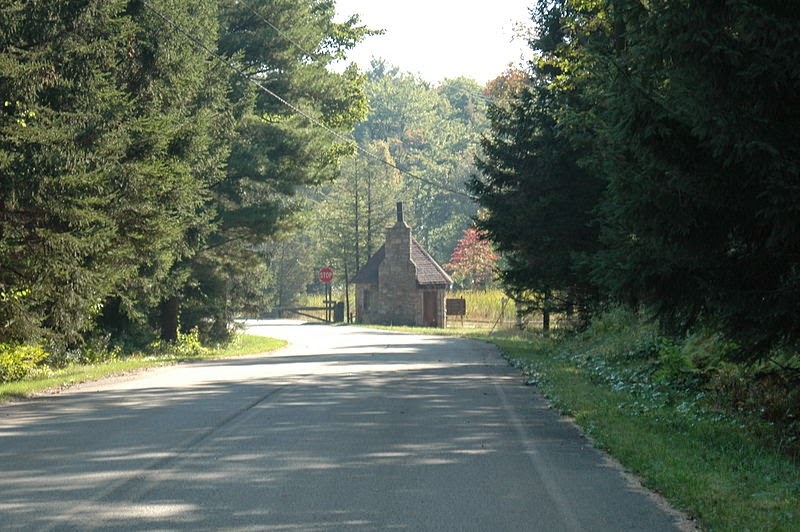 Located in Westmoreland, Fayette and Somerset counties, it was named appropriately in honor of General John Forbes, of the French and Indian War, Forbes State Park is contained within Pennsylvania Bureau of Forestry Disrtrict #4. With offices in Laughlintown in Westmoreland County. The main attraction is probably the Mount Davis Natural Area, having the highest peak in Pennsylvania. With over 20 tracts of land it covers a large area of 50,000 acres. District #4 also has land in Greene, Washington and Allegheny counties. When I gather more info I'll try to incorporate it in here. This is a large park of 1,200 acreage established in 1945. It is contained within Derry Township, which has the historic Samuel Patterson 'Drum' House of 1846 in Westmoreland County. It has part of the 70 mile-long nearby Conemaugh River shed, ('otter creek' in Algonquian Indian dialect), which contained the town of Livermore, of 1827 and a part of the western Pa Canal System, flooded out by the dam in the 1950's. Named for one John Kooser, an early settler who lived the spring of his life in the western part. Here is a small 250 acre park in Jefferson Township of Somerset County, surrounded on all sides by Forbes State Forest. The land was purchased in 1922. The Lake was made through the damming of Kooser Run by the Civilian Conservation Corps in the 1930's, referenced at the Forbes Park area of the article. There has been an algae problem for a few years. so swimming is not permitted, but the 4 acre lake allows fishing. The Park can easily be reached by way of Rt. 31. Interestingly, here there were consistent rumors and legends, of Indian battles near Kooser Run near or before the times of the frontier settlements. The State Park Family Cabin District is on the National Register Of Historic Places with 13 contributing buildings from 1987. Some of the cabins and campsites are furnished and have electric hook ups. Nestled among the scenic Laurel Mountains of the broad Appalachians, here is a large state park indeed, the granddaddy of PA state parks. Circumferencing over 13,000 acres and located within Fayette and Westmoreland, as well as Cambria and Somerset counties, this is a great place to come for a variety of outdoor enjoyments. Originating by a governor's pen stroke in 1967, most of the park is open to hunting from the fall to spring and this includes, grouse, turkey, deer and bear, but not groundhogs, understood? Dog training is a big thing here too, in designated areas only. In the southern perimeters are most of the picnic tables and pavilions which require a reservation for rent. Reservations can be made by calling 888-727-2757 (888-PA-PARKS). Many of these parks are kept up through the Department of Conservation and Natural Resources and policing by the PA Game Commission. According to a tantalizing statement on the associated Pa State Agency website, "One of the most exciting reasons to visit the park is for its scenery. Spring wildflowers dot the forest floor in early April followed by a vibrant green forest as leaf-out begins in late April. Mountain laurel blooms in June and rhododendron blooms in late June and early July. Come to the park in mid-October and witness fall color in all its glory. Winter is spectacular when the park is covered in a deep blanket of snow and the occasional great horned owl calls through the moon-lit forest." There is a recommendation for you, and they should know. You should check for more detailed rules there, if needed. There is an amazing 70 miles of hiking and backpacking trail running through there. Skiing and snowmobiling are also very popular, with a 120 mile, yes you read that right, 120 mile Snowmobile Trial System. So get out your gasoline and parkas and winter boots folks for a run from December on from Ohiopyle nearly to Johnstown! There are signs at major highway crossings and six parking lots at the starting points, with shelter areas every six miles. Some disagree with the format, as with many things, you do have to pay a fee for their usage. The trail runs basically east from Stewart Township and ends at Lower Yoder in Cambria County. There a few photos here at Laurelhighlands.org. Residing within Jefferson and Middlecreek Townships of Somerset County, much of Laurel State Park involved FDR's CCC program during the great Depression. The park includes within its premises 4,072 acres of forest, stream and hills. A main focus of interest is the Laurel Hill Lake, consisting of 63 acres in itself. It has 500 picnic tables available and a 1, 200 foot beach with boat mooring, an ADA accessible ramping and a playground. Free tables are there to be had too! Fishing is good here with bass, trout, catfish and perch and the hunting and trapping of most kinds is to be had on 1,200 acres, so get out your license, load up and enjoy. Don't forget the Laurel Hill Creek too, it is a favorite of my family. Watch it, those rocks are slippery.There are paddleboats, kayaks and canoes available, (these you must rent). There is goose and waterfowl hunting too. There are 12 miles of different named trails: the largest is the Lake Trail, the Ridge, Bobcat, Pumphouse, with the Jones Mill Run Dam, and the Tram Road, which covers much of the railroad logging area of Jones Mill of the early 1900's, being some of them. Much in the way of tenting and cabin camps are here too for the spring thru fall seasons. You name it, this is a wonderful place for it when it comes to outdoor activities. At the rolling hilled top of the dizzying Laurel Ridge area is a family-oriented park. It has fantastic views of the Ligonier Valley, near to Latrobe in Westmoreland County. There a lot of 'Laurels' hereabouts, and it could be confusing. This state park was initially begun back in 1939. It contains 493 acres and stretches into Jenner Township of Somerset County, south of U. S. Route 30. It started out as a private ski area of Richard K. Mellon, (1899-1970), an heir of Mellon Bank, Alcoa and Gulf Oil companies and benefactor of the University of Pittsburgh. He also served in the two world wars and rose to the rank of Lieutenant General. He is remembered for his popular urban renewal efforts. It was purchased by Seven Springs Mountain Resort in 2008. I haven't seen much of it myself, but this small six acre are of the state park has great surrounding views of the Laurel Ridge of Westmoreland County. It was purchased from the Byers and Allen Lumber Company and acquired In 1909. There are still scars than remain from the lumbering and forest burning that went on here and it is slowly being rehabilitated and restocked with deer.You can talk a nice walk to the 28 acre Spruce Flat Bog which is also partly within the magnificent 50,000 acre Forbes State Forest with 50 miles of marked and maintained trailing. There is some unusual plant life like pitcher, large cranberry and cotton grass, and many varieties of birds, including the ruby-throated hummingbird, golden-winged warbler and the eastern bluebird, always a happy sight. It is really said to be misnamed as there is more hemlock than spruce here. Altogether, the whole Wildlife Area covers 300 acres. Here the Audubon Society is in cooperation with the Bureau of Forestry to keep practiced and experienced eye on everything. Here is where the PW&S, (Pittsburgh, Westmorleand and Somerset), Railroad once ran, especially along the Fish Run Trail. Bogs are usually formed from glacial deposits, but they were not believed to travel this far south, and the original depths of this unique one or the type of past geological activity involved are unknown. There is a 2.7 mile trailhead to the Wolf Rock Vista toward the Linn Run Gorge. Incorporated in 1891, the borough of Ohiopyle is located on State Route 381 within Dunbar, Stewart, Henry Clay townships in good old Fayette County. It is divided by 14 miles of the Youghiogheny River Gorge. When teenagers we use to visit here often and enjoy the beauty and have fun at nearby Meadow Run with nature's own waterslides. We didn't neglect the swimming, or the fishing, either, and that still holds true. It is rightly famed for its enthusiastic whitewater boating and good campsites. Ohiopyle State Park was officially dedicated in 1971. It has the honor of being one of 'Twenty Must See Pennsylvania State Parks'. 1963 was the year for the transfer of 2, 800 acres from the Western Pennsylvania Concervancy to the Department of Forests and Waters of spectacular mountain land of Frencliff Park and Sugar Loaf mountain, famed Cucumber Falls and Keister Park. Traversed by PA Rt. 381, roughly from the southwest to the northeast. 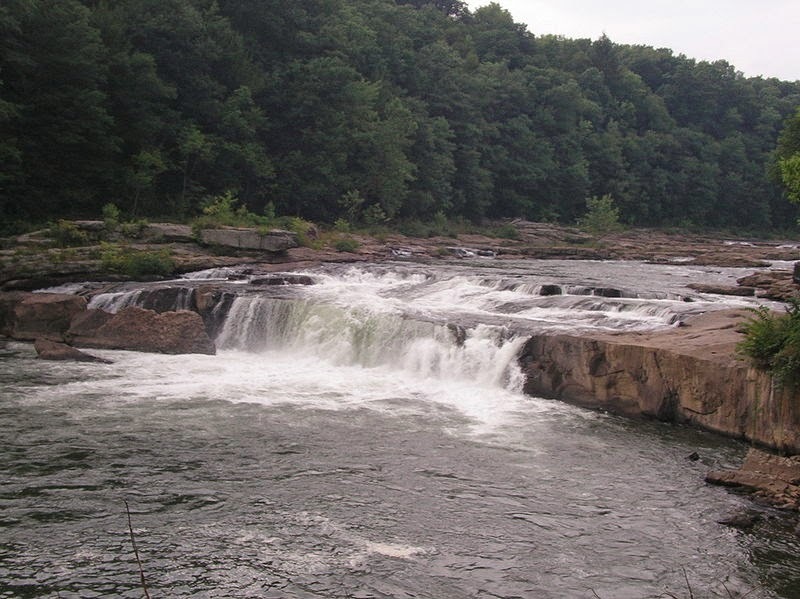 On the southern side of the Youghiogheny River, oddly flowing north and northwest, here began the creation of Ohiopyle. Ferncliff Peninsula has an interesting microclimate all its own. Justly conferred as a National Natural Landmark. The earliest known people here were the mysterious Monongahela Culture, as much because their fate and the factors involved remain unknown. Other tribes, like the Shawnee and Seneca, inhabited the area. The name comes from the Lenape od the Delaware, meaning ' it turns very white', or 'white frothy river', depending on who is doing the translating. George Washington passed through here in 1753, and again in 1784 searching in vain for a strategic water route through the Chestnut Ridge and to the forks of the Ohio. Later came the hunters and farmers. In the 1800's came many minor industries and mills. The tourist of early modern times came along with the railroads, starting in 1871 with boardwalks, dances, hotels and bowling alleys. There was quite a community here before the Project 70 Land Acquisition and Borrowing Act, which were displaced with serious protest in those days. Though a difficult situation, maybe in the long run it is for the best, in the sense of what has been preserved here, the control of the pollution. The place continues to be upgraded, which is needed in a lot of areas. Hiking and biking, fishing and camping, are all very popular here and connected with the Youghiogheny and Great Allegheny Passage river trails. Hunting is allowed on 18,000 acres and the scenic overlooks of the rugged Baughman's Rocks, Sugarloaf Knob and Paradise are sure to please the observer. You can book rafting tours of the Lower, majestic Middle, and even the cautious excitement of the Upper Yough, at the Laurel Highlands website. One of the smaller parks, it lies within Cook and Ligonier Townships on the eastern side of Westmoreland County, off PA Rt. 381 which traverses from West Virginia at Wharton Township of Fayette and through Ohiopyle on to Westmoreland County with 711 at Donegal and for a while joining with Rt. 31 then on to Cook and Ligonier proper. Bordered by Forbes State Forest, it is joined and fed by Rock and Grove Run and used for picnicking, and fishing, particularly trout, and is provided with 10 cabins for usage. There are four hiking trails. A 612 acre park, the Adams Falls is a scenic attraction. Hunting and trapping is also allowed on the second growth 400 acres of woodland and the usual rules applicable to state parks do apply. To learn more it is a good idea to check out the PA Game Commission Portal that has lots of info with the various rules and regulations to help keep you informed. You can still see the burned scarring from passing locomotives in the logging days. I called the list, 'the nine' because that was the broadest amount I decided to include AND, it's my favorite number! When I can get to more of these parks, I would like to try to supplement the post with more of my own photos. We'll see what the foreseeable future has in store. If YOU can find the time, a comment will always be appreciated. PLEASE, help preserve and protect OUR State Parks!